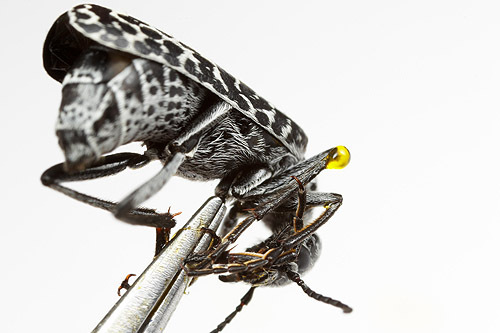 An Epicauta blister beetle reflex bleeds when grasped with forceps. Five points each to Tim, Ainsley, Neil, and Dave. And, ten points each to Pete and TGIQ. Posing on a mesquite flower. *what’s up with all the guessers-of-mysteries being bloggers? Are bloggers just smarter? P.S. That is SUCH A COOL BEETLE. I want one. Well clearly I need to bone up on my blister beetles and their biology. Don’t feel bad, James. It’s a trick photo (see my comment to Ainsley, below). Yep, I agree TGIQ… proud to be a geek! You’re the only non-blogger among the participants. What gives? Is Peteblog.com taken already? I’ve often thought about it, but the general standard of bloggery in the ento/bio fields is just so high it’s a little intimidating! So the single claw WAS a red herring! CURSES. That’s exactly why I cropped the photo that way. It’s the wrong angle to see the split tarsal claws, too. I totally went down that one-claw road too…but it ended up nowhere, so I figured it had to be a trick. Oh well, it would be neat if there were a spider with reflexive bleeding, but at least you are one great arthropod photographer that doesn’t shoot jumping spiders.